Presentation and Multimedia Mashup Tools: Something Different in John Wyndham’s The Chrysalids and in the Use of Web 2.0 Tools. Is PowerPoint “evil”? If PowerPoint is the only communication tool we’re teaching our students — at any level — we have a serious problem. The same is true if PowerPoint is the only teaching tool we use to impart information to our students. If we are choosing any communication genre or tool to the absolute exclusion of others, we have a problem. The grade 8s in our school recently completed a novel study on John Wyndham’s The Chrysalids. When the grade 8 English teacher (who prefers at this point to remain anonymous on the Internet) at our school came up with the idea, I was very excited for her class, as I had read the book when I was about 12 or 13 and it really affected me. In fact, I was so enthusiastic about this novel study choice that I entitled my blog TLkirsten’s Learning Chrysalid, which connected both with my sci fi theme and the idea that I am in the pupa stage of being a teacher-librarian (or Padawan, in Star War-ese). Note too that one of my very first additions to our library collection was this novel. So, why the quote from Monica Poole regarding Powerpoint? Well, I saw two significant connections here. Firstly, I felt that its last line, “If we are choosing any communication genre or tool to the absolute exclusion of others, we have a problem.” connected to the idea of exclusion in The Chrysalids. The rigidity and dogmatism of the primitive people of Waknuk makes me think of the rigid and somewhat dogmatic use of the relatively (as compared to many Web 2.0 applications) old-school Powerpoint, such as is done here. The people of Waknuk choose a limited definition of “normal”, and exclude those who do not fit within those confines. The grade 8 English class featured in this blog (only students from one of the classes are participating in my experiment) got me thinking about this, as a connection many of them made in the album covers and song choices meant to reflect themes in The Chrysalids was that of accepting differences. The second connection I made was regarding the appropriate use of collaborative presentation and multimedia mashup tools. Instead of using (or having students use) Powerpoint for everything because it is there, how can we carefully choose from the now wide selection of Web 2.0 applications to teach, learn and present learning? The slick Animoto application does allow for text, but the focus really is on imagery. Creating an Animoto is a cinch, and the results definitely have a hipper persona than e.g. a Slideshare and the showcase samples are very professional looking. Animoto eases the process further by providing a wide selection of copyright-safe music, backdrops, and an Animoto-creating app for iPhones. It allows comments, uploading to Youtube, and embedding on websites. I decided to use The Chryslids soundtrack album covers some of the grade 8s made as images for this activity in an attempt to highlight their work (the video is in the last section of this post). 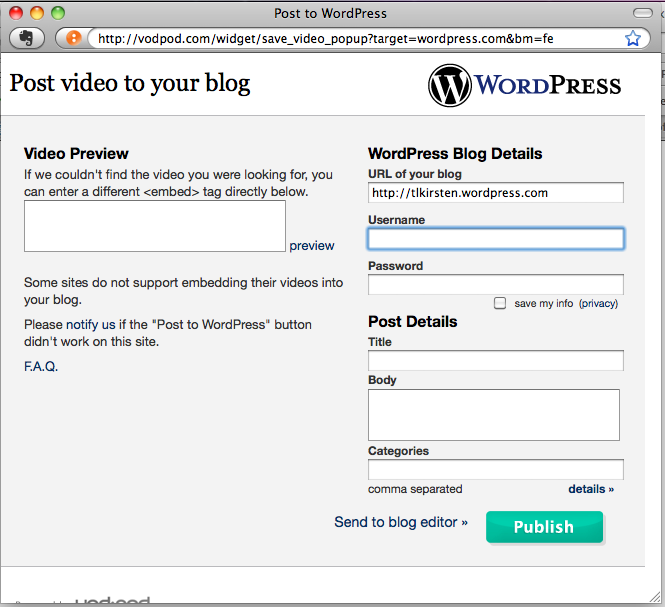 Embedding Aimotos or other presentation/multimedia tools on WordPress for free is of course more challenging, but as I mentioned in an earlier podcast, placing a Vodpod “Post to WordPress” button on your browser makes this possible. Just be sure to open up a new tab or window before clicking the button, and note that every time you use it, Vodpod will create a new post, so it is may be necessary to cut the now Vodpod-tweaked embed code out of that and put it where you want it, such as in a draft post you’ve already made. VoiceThread is very simple to use overall includes a variety of excellent support materials, such as tutorials. Voicethread features the ability to create group conversations (via moderatable text or audio comments) about a video, image and document slideshow, which can be embedded on websites and archived to e.g. DVD. I tested out The Chrysalids project with VoiceThread too (again, the results are in the last section of this post). There are also a couple of different kinds of education accounts, but the various paid accounts through Ed.VoiceThread provides teachers with a lot of control in a safer collaborative environment than on a regular account. Google Earth and Maps are amazing multimedia application that feature layered geographical and other information on maps, the globe, Mars, the moon, the sky, etc. 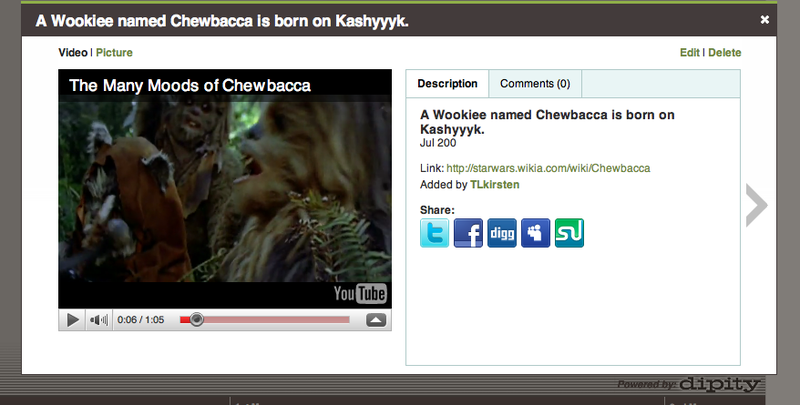 Users can make comments on contributors’ videos, images, and text. I decided to explore Google Lit Trips further, which augment the study of literature through the geographical and mashable media features of Google Earth. First off, Google Lit Trips opens easily in Firefox, but not Chrome. The Lit trips come with explanations of how to use the Lit Trip and Google Earth, as well as how to create your own Lit Trip, which I didn’t have the opportunity to do. Some Lit Trips also include slideshows with samples of Google Earth screenshots, podcasts, and can be subscribed to via an RSS reader. And, since we on are on the topic of dystopian literature in this post with The Chrysalids, I thought I’d attempt to find something within the same genre on Google Lit Trips. There isn’t much, if anything, in there that is sci fi, but in the higher ed section there is one for the excellent (but brutal) dystopian sci fi book The Road by Cormac McCarthy. Then I thought to explore two timeline-creating applications. 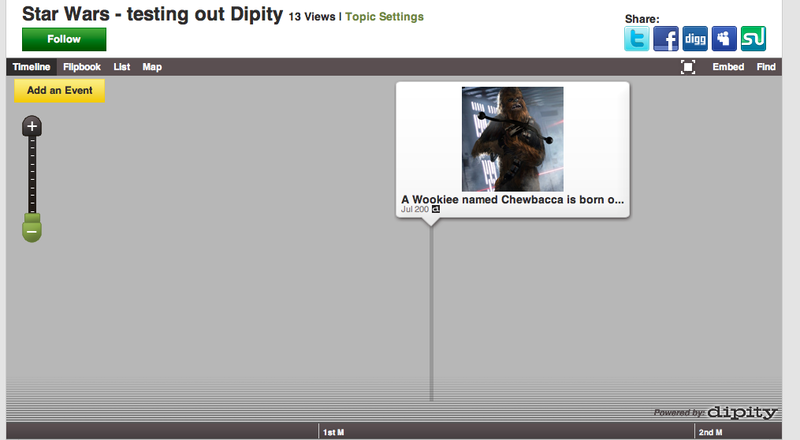 Dipity is a visually appealing and sophisticated timeline creation tool that allows you to view your timeline in a variety of different ways, includes maps of your events, videos, imaging, and allows comments and social networking sharing. There are plenty of publicly available timelines for viewing, such as this one on science fiction. Vuvox, which looked very interesting, but required a learning curve to which I didn’t have time to devote. Jing screencasts before, which are quite simple to make and are excellent for creating computer-based tutorials, as I’ve done on a previous post. Prezi, such as my example below, which has been described as Powerpoint on steroids (I can’t remember where I read that one) in that it sort of presents slides, but in a very non-linear, interactive way. It can be persnickety when building in certain browsers, as a warning. add to your children’s online or DVD scrapbooks (oops – my kids scrapbooks haven’t gotten past their first 6 months of life…one day!). While Animoto really is about promotion and basic sharing, VoiceThread is about collaboration and interactivity. An example of how to use voicethread for professional development through the presentation of materials and discussion about these slides/materials. Create a faculty project slideshow for school faculty to build and comment upon. Create a slideshow featuring your children for their grandparents’ sake and then have grandparents comment on the pictures using the voice feature for your children to hear. By the way, VoiceThread does allow voice comments to occur in different ways, including via telephone, so if you have relatives who are not technically adept, this is the way to go. create a Google Earth exhibit showing highlights of your family road trip. interview older relatives who migrated to different parts of the world, and then create a Google Earth or Maps presentation with photographs, stories, and history (find primary documents to corroborate said stories) for posterity. use it to promote upcoming events, school history, family history, etc. …Web 2.0 technologies support learners’ opportunities to construct and coconstruct ideas/knowledge and ways in which they can add their own interpretations into Web 2.0 tools that enable modding of existing products and collation of multimodal information from multiple sources through mashing. But, as I argued in my post’s introduction, it is key that we determine which of the many presentation and multimedia tools out there are the best fit for the activity and learning outcomes we are planning for students. Two handy resources to help educators with this process are found here and in regards to storytelling (best connected to my literature-based theme), here. In the introduction of this post, I connected the issue of using only one kind of tool with the exclusion of others as found in The Chrysalids. This applies too to differentiated learning, and how we can accommodate the various learning needs of students. management is recognized as a great potential for e-learning accessibility” (Ferretti et al., 2008, p. 178). In keeping these issues in mind, how can we use such tools in the classroom? Like my colleague who had her students create an album cover and songs for The Chrysalids and then justify/explain that choice, students who choose music for their Animoto could be asked to justify this choice, as well as the video style that acts as a backdrop, as I will do for you now. Because The Chrysalids is dystopian sci fi, the temptation might be to add some dark electronica music and one of the more techie-looking video styles. Instead I chose the “Earth” video backdrop to feature the students’ album covers. This is because a) the story mostly takes place in a relatively primitive agrarian village setting, b) this video style features a butterfly and c) the “Earth” style is mostly that – brown earth, but with flowers popping up, which to me represented the hope that is featured in some of the students’ album covers. The music I chose from Animoto’s selection was “I’m Right Here” for you, which connected with the repeated student theme of helping one another out. highlight hobbies and personal interests so that the school community has a better sense of the individual student. I didn’t have students create my VoiceThread due to lack of time and to be minimally intrusive to the teacher’s limited time, so I photographed and added the imagery, but requested that some students volunteer to post their comments explaining the connection their album covers and song choices have to The Chrysalids, and that they could comment and ask questions in a constructive manner of each other. I also encouraged them to invite family and friends to comment on their work. I don’t know if that will happen right away since, despite being enthusiastic about these sorts of things, they have just gone on a mid-term break and probably aren’t checking their school e-mail. Anyway, VoiceThread provides numerous ideas for use in the classroom. Also, the Langwitches blog provides more rather inspiring ideas here. Earth science, such as viewing the sunrise and sunset across the Earth, or the oceans (which includes field projects, shipwrecks, and featured animals). virtual field trips as developed through street views – see more uses for Streetview as described by Google. astronomy: view the sky (with constellations) as well as Mars and the moon. have students create a Google Lit Trip. timeline assignments, including samples/tips of where students should be at in any given point of the assignment. In the comments section, students can ask questions of the assignment. show cause and effect of historical, scientific, and literary events. Here (Vodpod won’t embed this one) is a student-generated timeline on The Chrysalids that I found after doing a search on Xtimeline. “Use a wide range of idea creation techniques”: clearly, having students experiment with multiple presentation and multimedia mashup tools, as I’ve described in this post, allows for this range. “Synthesize and make connections between information and arguments”: as I’ve done above in my example justifying my Animoto choices in terms of music and backdrop. “Incorporate feedback effectively” and “Deal positively with praise, setbacks and criticism” are skills developed as students work through user and peer tool-based comments, and trying to learn how to use such tools. “Leverage social and cultural differences to create new ideas and increase both innovation and quality of work”: the ability to comment and collaborate across continents and timezones through Web-based applications (especially through e.g. VoiceThread) makes this an important skill. “Understand and utilize the most appropriate media creation tools, characteristics and conventions”: as I’ve argued throughout this post, it is important to select tools for the job. The grade 8s also inspired me to consider The Chrysalids as representing not only the idea of accepting differences in both people and in tools, but also to consider that like some of the characters in The Chrysalids, students and educators, through collaboration and sharing provided by appropriate use of the Web 2.0, can help one another through the learning process. I also thought of the idea that one of the children in The Chrysalids could actually read minds on the other side of the planet. While we may not have that ability naturally, with Web 2.0 tools we almost can through global sharing and collaboration. Ferretti, S., Mirri, S., Muratori, L., Roccetti, M., & Salomoni, P. (2008). Cooperative multimedia management for participative learning: A case study. New Review of Hypermedia & Multimedia, 14(2), 177-197. doi:10.1080/13614560802624233. Hedberg, J., & Brudvik, O. (2008). Supporting dialogic literacy through mashing and modding of places and spaces. Theory Into Practice, 47(2), 138-149. doi:10.1080/00405840801992363. I really like your comparison of the various presentation tools. I hadn’t thought of Google Maps/Google Earth as being a presentation tool, but now I want to set up a tour! Kirsten – Good blog! I didn’t get to explore the timeline tools, so thanks for that! Particularly liked your intro quote about exclusivity. We do need to show variety and teach the various tools – how boring would class be if it was only 1 tool?! I’m excited about all these new options and have already started talking to my staff about them (on 2 different occasions just today!!). Teaching should be fun, just like learning and I feel a slight new spring in my step with this new arsenal of teaching & learning tools. Thanks for all your great ideas! We have a presentation tool called Freepath. Mix slides with video, audio, online content, desktop files–you name it. Drag and drop your files in their various formats directly into Freepath. Bring all of your content together in a single playlist. Simply drag, drop and teach! Content is everywhere — on your desktop, online…use it!